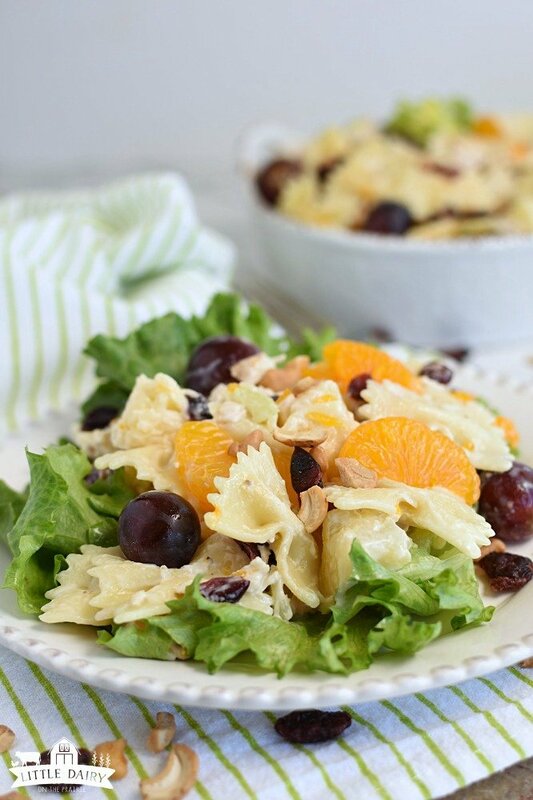 Summery Chicken Pasta Salad is full of colorful fruits and vegetables; mandarin oranges, pineapple chunks, grapes, celery, and onions. It’s tossed in a tangy and creamy dressing that makes all the flavors shine, then is topped with crunchy cashews! Light main dishes salads like Chicken Pasta Salad are exactly the kind of recipes you’ll go back to over and over all summer long. 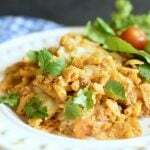 It can be made ahead which leaves plenty of time leftover to enjoy your summer days! If you are looking for an easy, yet incredibly scrumptious go to salad this summer look no further than Chicken Pasta Salad! 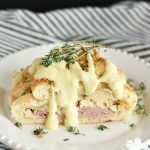 Take it to barbecues, picnics, or serve it for a simple and light dinner! I have a feeling this salad is going to show up on your menus all season long! Isn’t summer the best season of the year? I wish it could last forever! Of course I love the warm weather, the long days, and the fact that I don’t have to worry about algebra or piano lessons! It’s so nice to finally be able to spend our evenings doing whatever wewant instead of working on science fair projects! During the summer we squeeze as much as possible into every single day. My boys all work on the farm until quite late and then we play after that! By time we finally convince ourselves to wrap it up and call it a day it’s way too late. My boys are always starving at the end of a long summer day and I’m usually not in the mood to start making dinner. That’s why we thrive on quick and easy meals all summer long! Having a big bowl of Chicken Pasta Salad in the fridge when we finally get ready for dinner is a lifesaver! It’s delicious served all by itself, or it’s pretty on top of a lettuce leaf! Being able to throw it together it ahead of time makes it a perfect option for late nights. Because it’s portable it’s just right for packing up and taking to the cabin, the lake, or on picnics too! 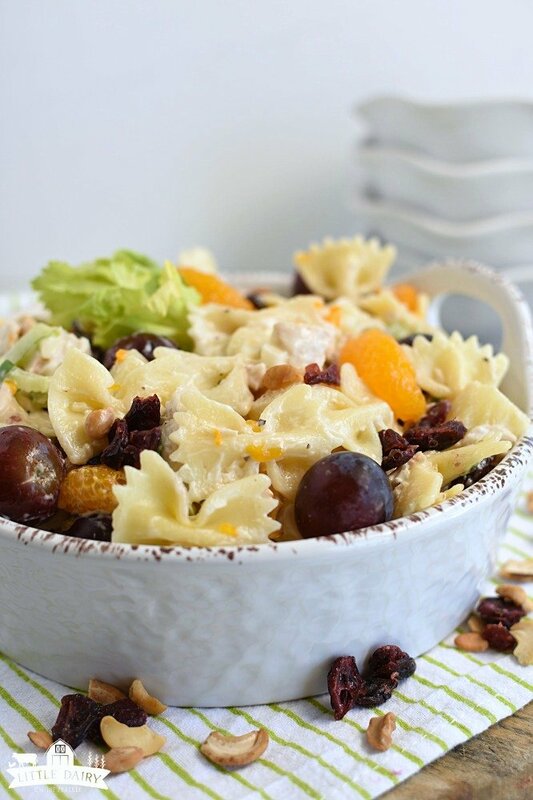 Chicken Pasta Salad has so many fresh flavors packed in it! I used to turn my nose up at salads that had both fruits and veggies in them. You guys, there is something magical about combining juicy and sweet Signature Kitchens Pineapple, Signature Kitchens Mandarin Oranges, and fresh grapes with crunchy celery and flavorful onions! You just have to try it! It’s heavenly! Oh and by the way I absolutely love getting my fresh produce from Albertsons! It’s kind of hard to find good produce in Eastern Idaho and they have the BEST fresh fruits and veggies. Albertsons also has a huge selection in their meat department, and at reasonable prices which is important when you are feeding three hungry boys every day! For this salad I use their Signature Farms Boneless Skinless Chicken Breasts which are available exclusively at Albertsons and Safeway. I almost always choose their hand trimmed chicken because it’s one less job for me! Adding plenty of chicken to Chicken Pasta Salad is my trick for getting my boys to consider it a main dish! They gotta have their meat! I buy Signature SELECT, Signature Kitchens, and Signature Farms products exclusively at my local Albertsons store. You can also find the same products at any of the other Albertsons Companies family of stores including; ACME Markets, Safeway, Jewel-Osco, Vons, Pavilions, Randalls, Tom Thumb, Shaw’s Star Market, and Carrs/Safeway. To find a store near you click here. Check out their awesome food prep and recipe ideas too! There’s nothing that says summer quite like gathering around on the deck and enjoying late night dinners! And you know Chicken Pasta Salad will be on the menu all summer long! 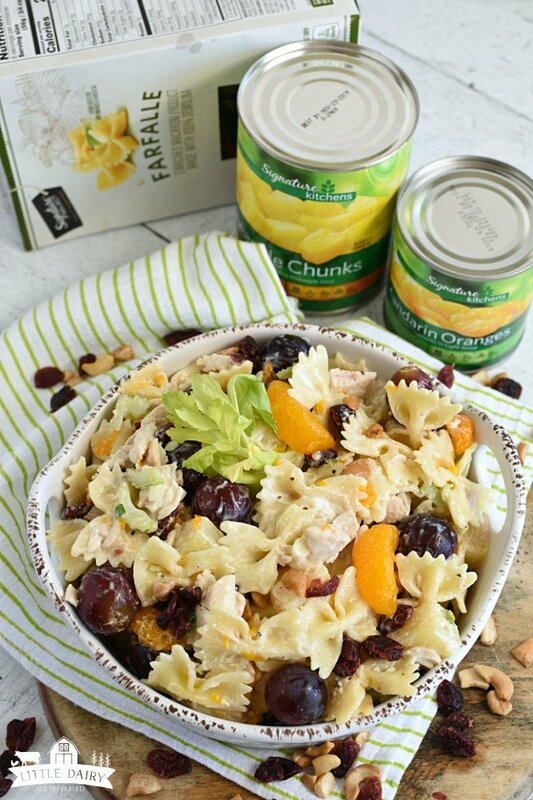 Summery Chicken Pasta Salad is full of colorful fruits and vegetables; mandarin oranges, pineapple chunks, grapes, celery, and onions. It's tossed in a tangy and creamy dressing that makes all the flavors shine, then is topped with crunchy cashews! Light main dishes salads like Chicken Pasta Salad are exactly the kind of recipes you'll go back to over and over all summer long. Mix mayonnaise and coleslaw dressing together. Set aside. 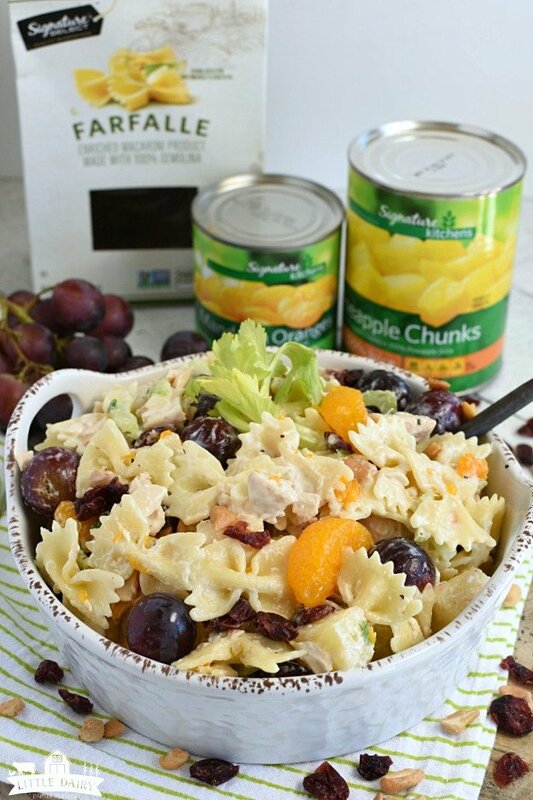 Add pasta pineapple, mandarin oranges, celery, onions, grapes, cranberries, cashews, and chicken to a large mixing bowl. Pour mixed dressing over other ingredients in bowl. Serve on a green lettuce leaf if desired. NOTE: For this recipe you can use either grilled chicken or chicken cooked in the slow cooker or pressure cooker. 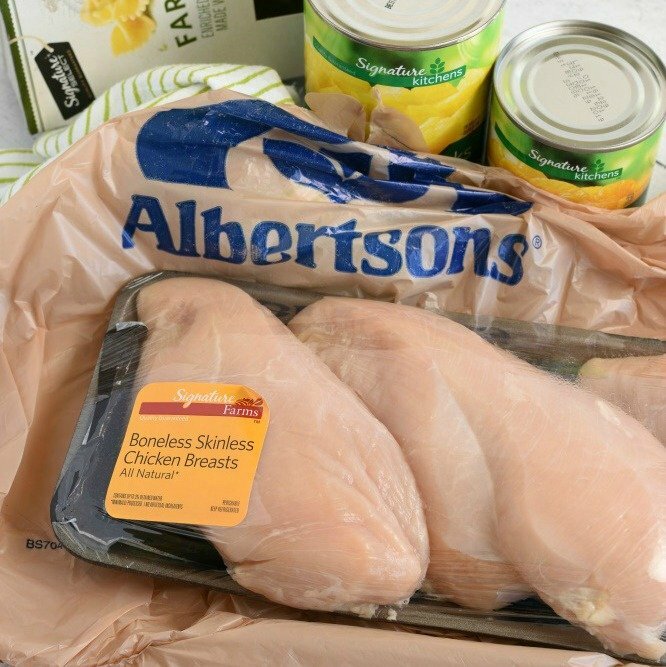 This post was written by me on behalf of Albertsons! 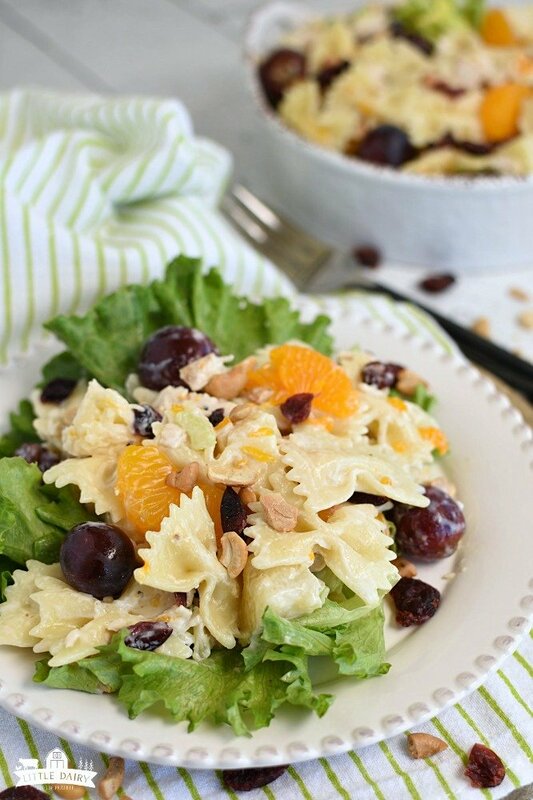 This chicken pasta salad looks delicious! My family would eat this up! My family goes crazy for it and I love that I can make it ahead! The family absolutely loved this! The kids wanted seconds and thirds! Yay! Now that’s a win! My kids love this salad too! This is such an amazing pasta recipe! Love the flavor combinations! 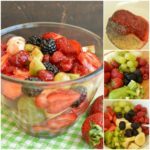 There are some really fun flavors packed in this salad! It’s just right for summer evenings! I love pasta salad! This chicken looks so tender and delicious! It hits the spot especially after hot long summer days! I love summer too! This might just become my new go to dish for all my summer get togethers. Looks delicious! Thanks! You are going to love it! 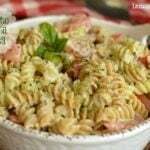 Pasta salad has always been a favorite of mine! Love that you added chicken! Me too! I’ll take carbs any way I can get them! And anytime salad doubles as a main dish I’m happy! Nothing beats a good chicken salad! This is a must make at all Summer BBQ’s! Thank goodness it makes a huge batch because it’s always gone in a hurry!